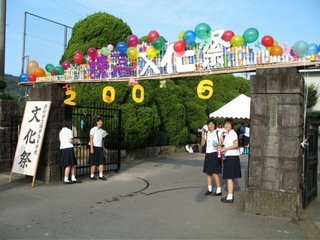 Here is the entrance to Isahaya High School's Bunkasai (one of the several festivals here lately) - "Bunkasai" is a cultural festival, and I was amazed at what was offered at the one hosted by the "Kanko" (IHS nickname) students. The students practiced their routines and performances well into the night each evening after school, and though they must have been tired on the day of the festival, you'd never have known it to see them! 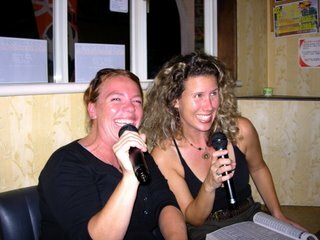 This is my first time doing karaoke in Japan, and I think the first time doing it since Project Graduation (that would be high school grad) with Danielle, Bob, and Cara! Dawn's thought bubble reads, "She reeeeally needs to keep the day job!" 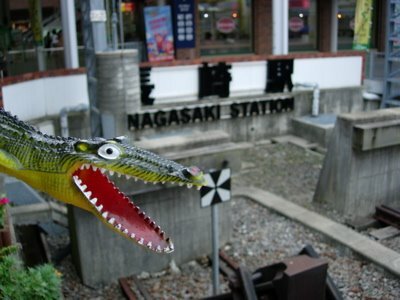 Sam went on a field trip with me to Nagasaki City, which is about 20 minutes away by train. The purpose of my visit that time was to find a bike store so I can get a good mountain bike since I couldn't bring mine from home. Funny how things work out, though - because if I HAD been able to bring my US bike, I might very well have missed out on meeting Taniguchi san and his little (bike) touring group! I even had the good fortune to be in the bike shop at the same time as the team leader, Keizo san, and he was nice enough to give me a lift back to Isahaya. And that's just the beginning! There's more to the story - an invite for Christmas Mass and dinner, trips to amazing places, underwear shopping at the "100 yen" store, onsens, yakiniku and hanbagu - all this and I haven't even bought my bike yet! I'm tired now, though, so you'll have to check back for the story later (don't worry - it's not what you might think -it's all PG! this IS Japan, afterall!). ("It looks like you're having a good time!") As you can see, Sam wastes no time in making new friends in Nagasaki city! Chizu! So here is the English department at Isahaya Koko. They took me out for a welcome "enkai" (party) which included lots of food and lots of drinking...great fun! 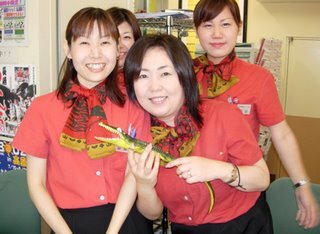 I think this is why the Japanese teachers and staff get along so well! Everyone seems to go out to drink and eat (emphasis on the drinking) together often! I thought the Japanese principal we interviewed the last time I was here was kidding - no! What makes for a nice workplace environment? Drinking and karaoke! Really! By the way, Takahama sensei, my supervisor, is the guy in front of me with the tie. My first 5 classes (40 students each, 2 class periods I had 80 kids!) went really well today - they seemed to have a good time, and of course Sam was a big hit. After school I caught the bus home and then ran/walked back to school (about 45 min or so). It was about 6pm, so I hung around the groups practicing sports and their routines for the festival. These kids are really amazing - after school clubs are just what they all do - they play, rehearse, etc. instead of getting into trouble or playing video games. Anyway, I wandered out to the (boys) softball practice (they know that I play). Get this. They all saw me, and actually ALL STOPPED WHAT THEY WERE DOING, TURNED TO ME AND BOWED, saying "konnichiwa". Omigosh...I didn't quite know what to do! I kinda bowed back and returned their greeting in English. Then they gave me a ball and a glove and I threw with one of the guys for a bit. And I wouldn't be surprised if there's a pair of cleats my size waiting for me at my desk tomorrow. I really think the want me to play with them ??? One of the guys asked me - probably on behalf of the team - to come to their game next week. Then, when I left, they all stopped and bowed (they stayed down awhile!) again! 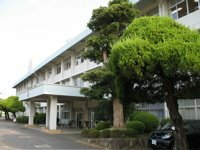 As I was just told today (if I understand the "Japanenglish" correctly), our school property was apparently the site of some sort of a castle during the Edo period. 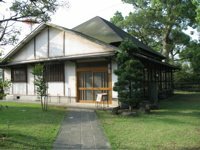 Therefore, this lovely little garden has been preserved, and the students use it for practicing dance, music, etc. How bad can my day get if I can go out the front door of the school, sit on an ancient stone bridge, and visit with the koi? 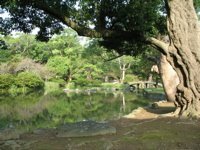 Sado - "the way of tea"
I take great delight in going out to this little tea house (pictures of a tea ceremony to follow later this week) and the garden that we have here on the grounds (I can't believe I go to "work" here every day! ).